The technological landscape has changed dramatically since we first studied dating and relationships in the fall of 2005. At the time we conducted our first survey on this topic, the release of the iPhone was still two years in the future, Facebook was in the process of expanding from college campuses to high schools, and just one in ten online adults used social networking sites of any kind. Today six out of every ten Americans use social networking sites (SNS) such as Facebook or Twitter, and more than half are smartphone owners. In this chapter, we examine some of the ways in which mobile phones and social networking sites are impacting the world of dating and relationships. Social networking sites offer fertile ground for checking in on past relationships, and also for posting updates about current ones. One third (31%) of all SNS users have gone on these sites to check up on someone they used to date or be in a relationship with, and 17% have posted pictures or other details from a date on a social networking site. Younger adults are particularly likely to have done both of these activities compared with older adults. 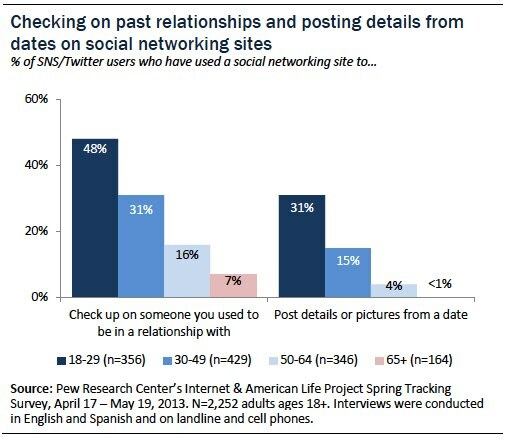 Some 48% of SNS users ages 18-29 have used these sites to check up on someone they dated in the past, and 31% have posted details or pictures from a date. Otherwise there are few demographic differences when it comes to either of these behaviors. 30% of SNS users with recent dating experience have used these sites to research prospective partners; they also offer a venue for linking up with “friends of friends,” and for asking people out on dates. Social networking profiles often contain a wealth of valuable information to potential suitors—such as personal photos, current relationship status, or information about one’s hobbies and interests—and many users are taking advantage of these sites to research people they are interested in romantically. Nearly one third (30%) of SNS users with recent dating experience17 have used a social networking site to get more information about someone they were interested in dating. Social networking sites also offer an additional venue for meeting or being introduced to “friends of friends.” Some 12% of SNS users with recent dating experience have friended or followed someone on a social networking site specifically because one of their friends suggested they might want to date that person. These questions were only asked of a subset of SNS users so our ability to do demographic comparisons is somewhat limited, but younger SNS users clearly stand out when it comes to each of these behaviors. 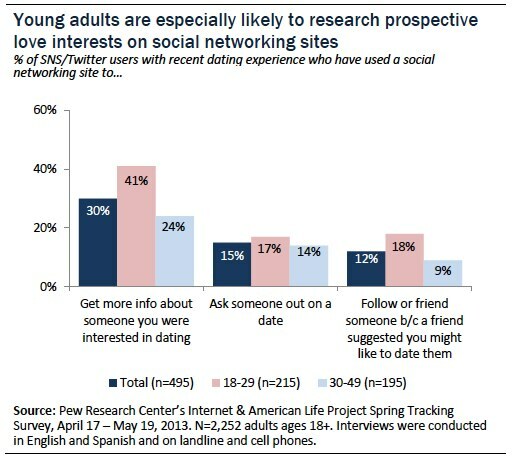 Some 41% of SNS users with recent dating experience in the 18-29 age group have used a social networking site to get more information about a potential partner (compared with 24% of those ages 30-49), and 18% have followed or friended someone specifically because someone suggested they might like to date that person (double the 9% of 30-49 year olds who have done so). Beyond using these sites as a tool for researching potential partners, some 15% of SNS users with recent dating experience have actually asked someone out on a date using a social networking site. Men are somewhat more likely than women to have done this (19% vs. 11%) but otherwise this behavior is relatively consistent across demographic groups. Dating and relationships can produce negative or distressing consequences: Flirting can become uncomfortable, or relationships themselves can end and necessitate a cutting off of contact between parties. And the social networking world is now part of that story. 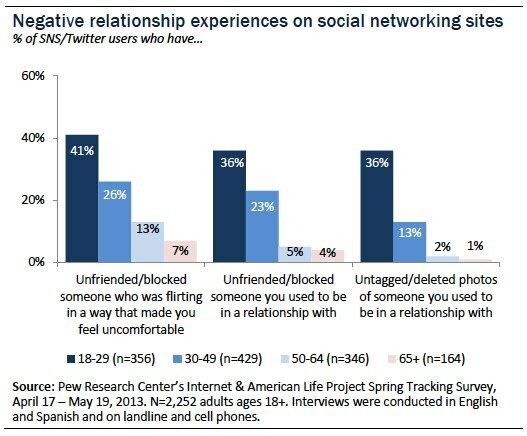 Some 27% of all SNS users have unfriended or blocked someone who was flirting in a way that made them feel uncomfortable, and 22% have unfriended or blocked someone that they were once in a relationship with. These sites can also serve as a lingering reminder of relationships that have ended—17% of social networking site users have untagged or deleted photos on these sites of themselves and someone they used to be in a relationship with. Not surprisingly, young adults—who have near-universal rates of social networking site use and have spent the bulk of their dating lives in the social media era—are significantly more likely than older social media users to have experienced all three of these situations in the past. Along with young adults, women tend to have greater exposure than men to some negative aspects of dating in the social networking era. Female social media users are significantly more likely than males to have blocked or unfriended someone who was flirting in a way that made them feel uncomfortable (33% of female SNS users have done this, compared with 19% of men), although women and men are equally likely to have unfriended a past flame, or to have untagged or deleted photos from a past relationship. 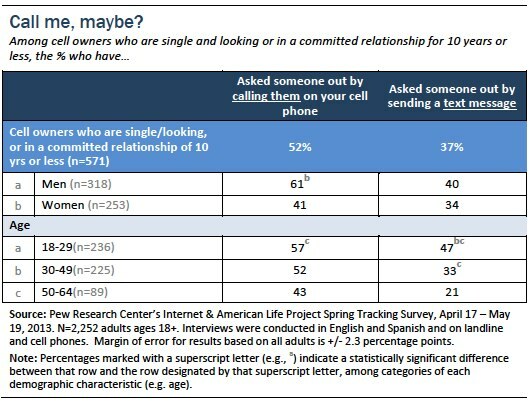 Younger adults (those ages 18-29) and those in the next age group (ages 30-49) are equally likely to have asked someone out of a date with a voice call. But younger adults are significantly more likely than those in their thirties and forties—by a 47% to 33% margin—to have asked someone out via text message. Interestingly, men and women are equally likely to have asked someone out via text message, but men are much more likely to have done so via voice call. 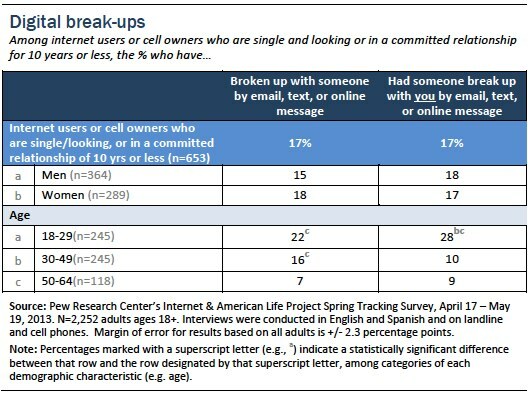 Younger adults are generally more likely than older adults to have been broken up with (or to have broken up with someone) via digital means.